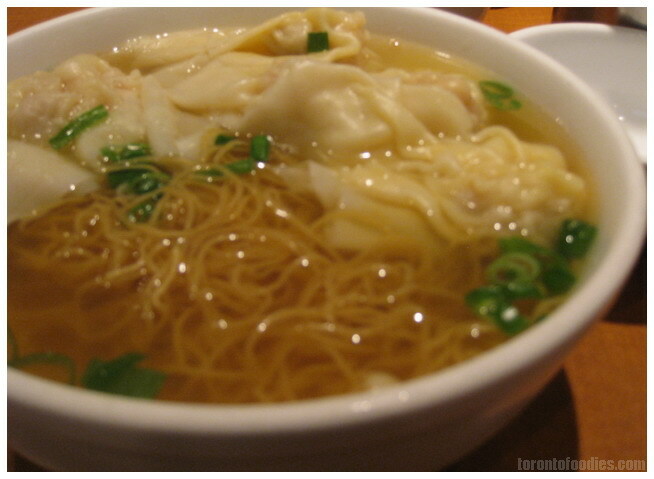 there have been numerous debates on the best wonton noodles on spadina, and the conversation usually points to king’s noodle, dumpling house, or goldstone. relatively busy past 9pm on a thursday night, we figured that the crowd would be a good indicator. 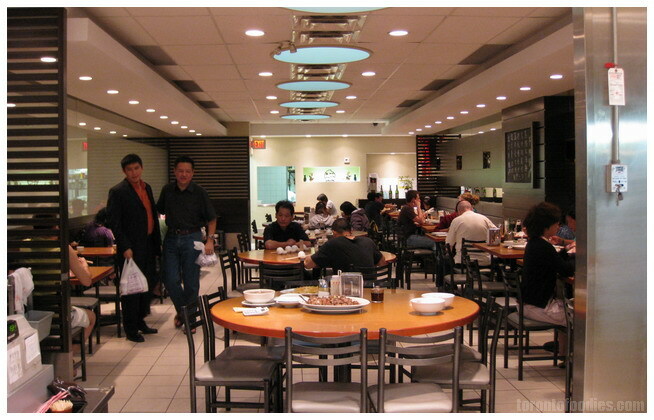 seeming to have taken a cue from asian legend, they have modernized their interior decor, and there’s a general feeling of cleanliness now (as compared to other aging chinatown haunts). i normally use the wonton noodles ($3.99) as a yardstick to judge a cantonese noodle house. served with 5-6 wontons, and enough noodles for 4 small bowls, the quantity certainly was not lacking. the wonton filling was just a little bit on the doughy side, but the flavour was fine. the wrappers, however, felt closer to dumping wrappers; they weren’t the traditional thin, slippery wonton wrappers. the noodles themselves were overcooked or simply weren’t fresh; a little bit soft, instead of al dente ~ elastic texture. the bbq pork and roasted duck noodles ($6.50) came with a reasonable amount of meat, as well as a few stalks of bok choy. the bbq pork, while passable, had a few end pieces that were dry and stringy. 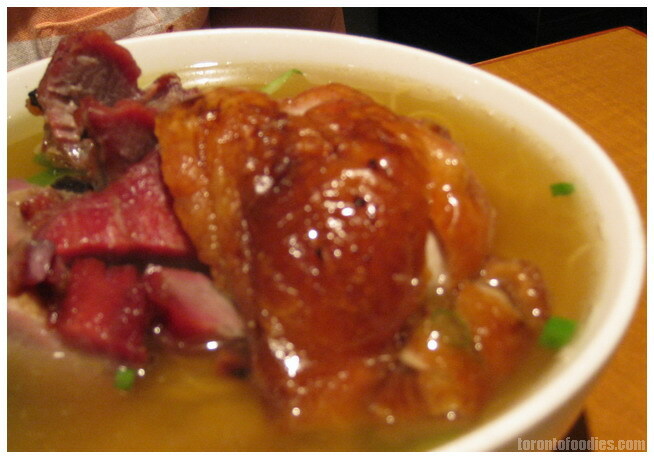 the roast duck would have been great on its own, since it was very light on five-spice and soy sauce seasoning. 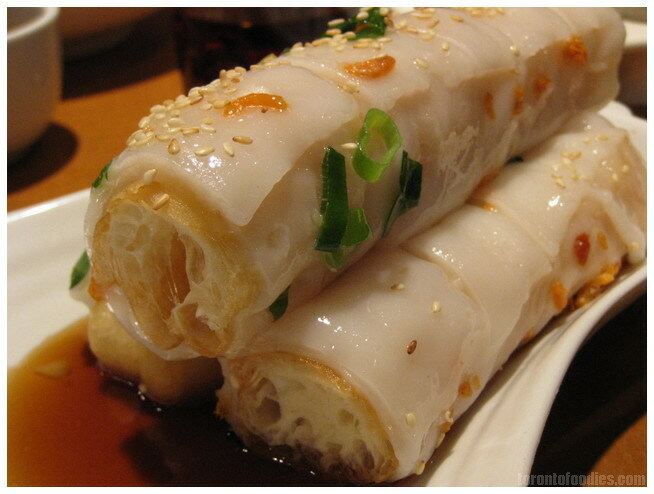 the fried doughstick in rice noodle [cantonese: ja leung] ($3.50) came along after we had finished most of our noodles. it came sitting in a mildly sweet soy sauce (the sauce normally served with rice noodle dished at dimsum), without the traditional peanut and sweet bean sauces for dipping. the doughstick were densely doughy and lacked the crunch and crispiness that normally makes this dish a unique contrast in textures. while plentiful, the apring onions and dried shrimp were very much clumped together. 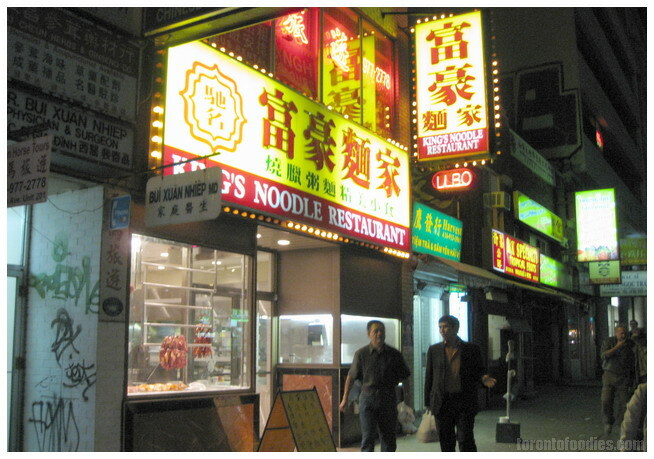 in the end, King’s Noodle Restaurant was all show and no go — nowhere as good or reliable as Goldstone.